Minions. 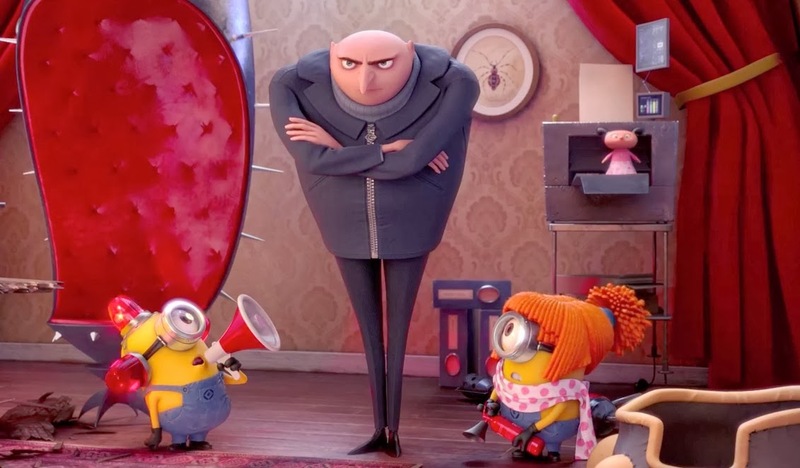 Your ability to enjoy Despicable Me 2 - probably on long repeat if you have little ones who have managed to get hold of a copy for Christmas - will come down almost entirely to how funny you find the minions. This is a pretty odd series of events when you think about it. A major CGI film, one of the biggest of the Summer, reliant not on a well drawn central character or the vocal talents of a star, but on supposedly peripheral yellow sidekicks, sometimes with names sometimes without, who don't have any lines to speak of and when they do end up saying things like 'tee hee... bottom'. You imagine this wasn't quite how Universal saw things going - to the point where 2015 will see the minions treated to their very own movie - but you never know: some evil creative genius may well have predicted the popularity of small banana-coloured, potato croquette-shaped creatures long ago. What the above fact means for Despicable Me 2, for anyone who's bothered about more than bottom jokes, is that there is on occasion a gaping whole when the minions disappear. Steve Carell's note-perfect Gru accent is still entertaining and his will they/won't they, working relationship/romance with Lucy (Kristen Wiig) hits the right notes of sweetness, but even with that and definitely beyond it there's a lack of laughs here in a plot that only had one place to go: another superhero-like battle between good and evil. Whenever screenwriters Cinco Paul and Ken Daurio depart from that - Gru dealing with one his adopted daughter's first boyfriends - the laughs seem to dry up and very little gets added to the plot. For those looking there are the now-obligatory knowing winks by directors Pierre Coffin and Chris Renaud to a host of 'grown-up' films, Alien and Close Encounters Of The Third Kind amongst them, but if you gave up on that game at around the time of the second Shrek then there's nothing that's well done enough here to bring you back to it. The lack of genuinely new ideas can also be evidenced by just how long this feels. At 100-odd minutes, it's perhaps 10 minutes too long for a children's animation anyway, but at around the hour mark it felt to me as though I'd been watching it for much longer, the plot dragging towards the inevitable confrontation and the minion-centric finale. Of course, if you find the little yellow ones highly amusing - there are at least four solid belly laughs from them - then none of the above will really matter. I thought it was a lot funnier than the first one and that is because I like the minions and they are the best part of the film. The shorts were also extremely funny. Will have to search the shorts out. Have seen them mentioned a few times now but they weren't on the screener I had of the film.